oh, canada. — SOMEDAY, SARAH. back on the road with L&TO. kind of. they're currently on tour in canada, but i'm not with them; i only helped them get there. because, do you know how long it takes to drive from nashville to winnipeg? or, then, from winnipeg to edmonton? me neither, but it takes a lot of hours – and also a lot of effort and patience and tag-teaming with two small children in tow. we made our way to winnipeg first and spent a few off days in their hometown. they stayed with jodi's mom and i stayed with chris' cousin and her family, which meant my off days were true off days. like i didn't even see M for three days, off. this was my second time in canada, but the first time i've stayed longer than 18 hours. i think i got a little bit more of a real canadian experience this time. the first day, i woke up to a winter wonderland. they got something like two feet of snow overnight and into that morning. but things carried on as usual. because, canada. at dinner the night before, as we talked about how much snow they were supposed to get, i shared how nashville got three inches of snow recently and schools were closed for four days. J, who is in high school, responded by telling me he's never missed a day of school for snow before. snow days are just not a thing in winnipeg. i asked how much snow it would take for it to make a difference and they all paused and looked at each other. then, finally, "it's really just a matter of getting out of your driveway." so basically, their only delay is how long it takes for them to shovel their cars out. i grew up in connecticut, so i'm not unfamiliar with the snow shovel life. i used to drive in snow and on roads that weren't completely clear. but even then, we always had a handful of snow days each year. sometimes the state would shut down and the governor would recommend that everyone stay off the roads. in new england, we chuckle at the southerners who think rain is a legitimate reason to stay home and marvel at how a few inches (granted, with even fewer snow plows) is enough to slow an entire city to a stop – or cause much chaos, if it doesn't. in winnipeg, i experienced a whole other level of keeping-on, even with a significant amount of snowfall. they cleared their driveway and the kids went to school, the dad went to work, and the mom brought the dog to the vet. not letting the snow impact them at all is a source of pride for them, or so i'm told. i hopped in the car on the way to the vet and was dropped off at a local coffee shop. generally, i enjoy a good snow day for the way they're so cozy. snow days are for staying in your pjs, wrapping yourself in a blanket, and drinking hot chocolate while you read a good book. they are for baking cookies and sitting in front of a large window (inside, where it's warm) and soaking in the beauty that is bare trees coated in fresh, white snow – while you eat warm and gooey cookies straight out of the oven. 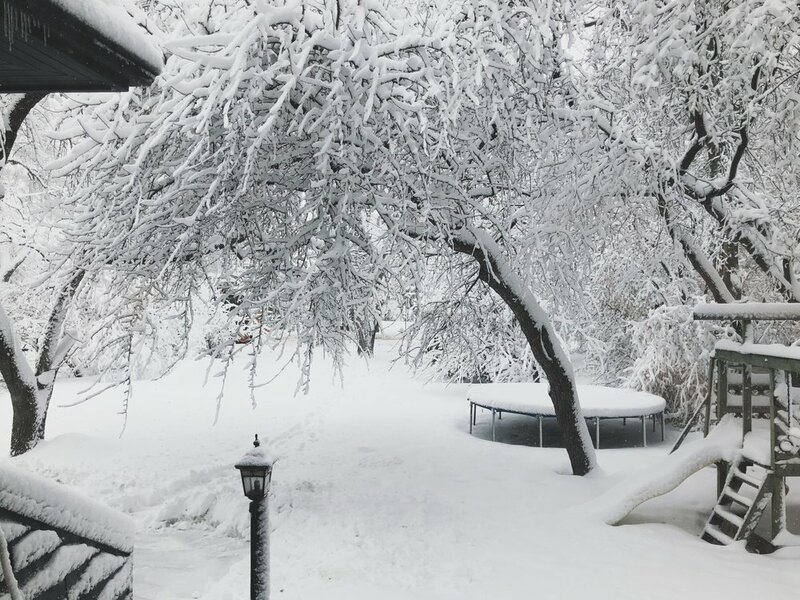 they are for saying no to things – things you wouldn't ordinarily be able to put on hold – simply because it's a snow day. snow days are the closest i've ever come to experiencing the world (or, my world) hitting a collective pause button. the way everything stops for the holidays, except without the pressure of hosting and cooking. you get to be in your own space, making your own choices, and everyone is on the same page. it feels like taking a deep breath. except no one stops in winnipeg, so i didn't either. i put on real clothes, layered up, and went out. i walked through a snow bank and on slushy sidewalks and let snowflakes melt into my hair as they fell. i didn't hate it, although probably because i already had the day off. i didn't need extra time or extra rest. i wanted to adventure instead. different day. same coffee shop. i got dropped off in the morning and spent a few hours writing at the coffee shop before walking down this same street to a bakery that smelled so heavenly i didn't even think about snapping a photo of all the treats behind the glass. i walked home from there, since i didn't have a ride and it was close enough to walk. the day before, i took in the beauty of the fresh, white snow and the houses of all different shapes and sizes and colors as we drove to and from the coffee shop. on this day, my eyes were glued to the ground as i focused on each step, making sure i didn't slip or fall. the sidewalks were clear, but "clear" in winnipeg means a few inches of packed snow and ice, like the ground is simply an extra layer or two thicker and, at any given point, you could hit a slippery spot. on my final morning in winnipeg, i decided to mix it up and walk to a nearby tim horton's because, when in canada. it was six degrees (fahrenheit) as i walked, about 15 minutes each way. which isn't the worst situation to be in, especially considering how incredibly flat it is there, but if you know me at all, you know that's not a situation you're likely to find me in. freezing cold? wearing layers (upon layers) of clothing? being outside? any form of exercise? no and no and no and no. but i did it for the timbits. willfreeze4timbits. later, we drove to edmonton, where they'd be starting their tour. with an impromptu stop at a tire shop the next morning, we finally made it just after noon. after a relaxing three days off, the next couple days felt like a sprint – but a sprint to the finish line, because i flew back to nashville (my first international flight! and lol at my not knowing when i did and did not need my passport at the airport) on the afternoon of their first show day.